Tuesday, December 23, 1913: Made some more today. It wasn’t so bad. You see I know more about the making from experience. Practice makes perfect. The previous day Grandma tried to make taffy, but it didn’t turn out right. Since my Black Walnut Taffy turned out perfectly yesterday, I’ve moved on to making gift boxes for my candy. 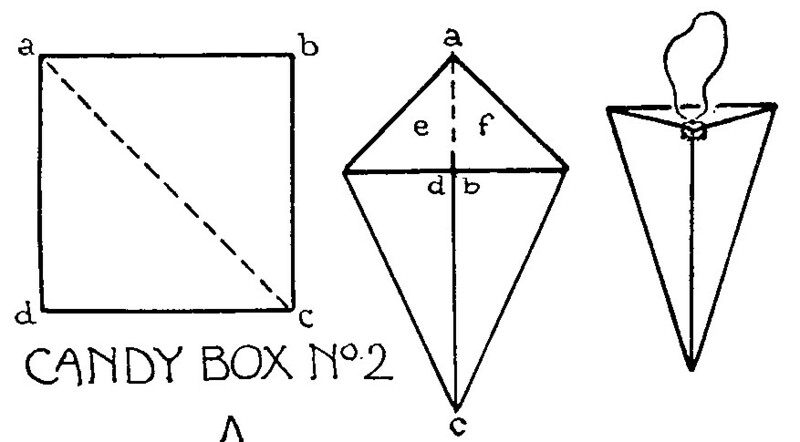 The December, 1912 issue of The School Arts Magazine had directions for making a triangular candy box. A square piece of heavy craft paper is used to make the box. To measure a square, take one corner of the paper and fold to the opposite side. Cut the paper to create the square. 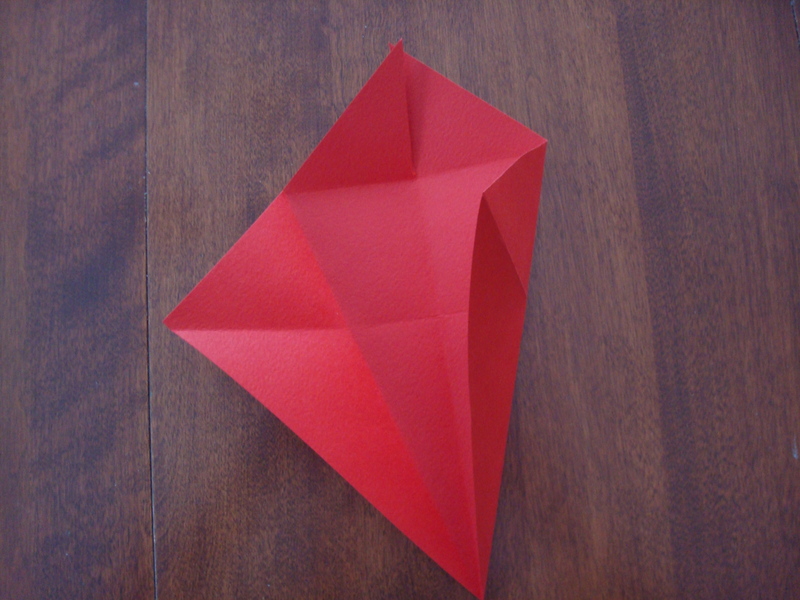 Unfold paper, and fold on the other diagonal. Then, fold one corner of the paper to the crease made by the previous folding. 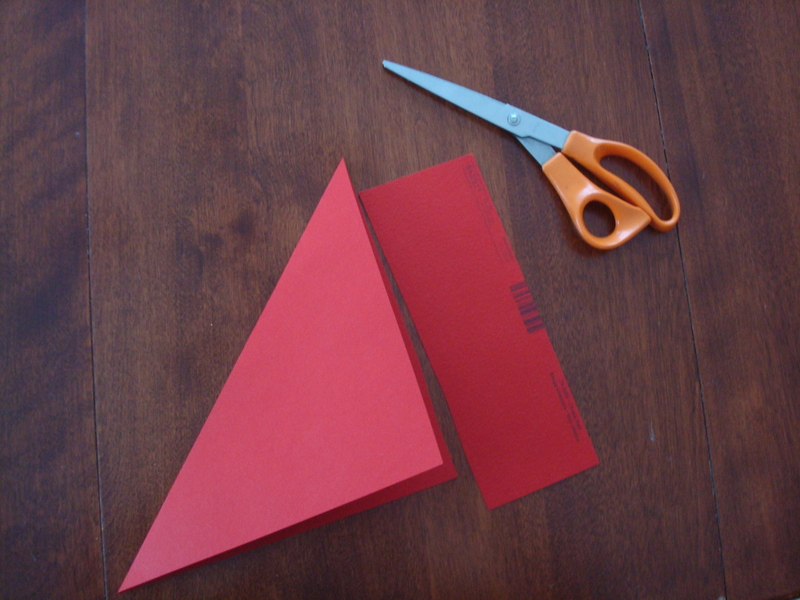 Unfold paper, and cut a slit to the new fold. 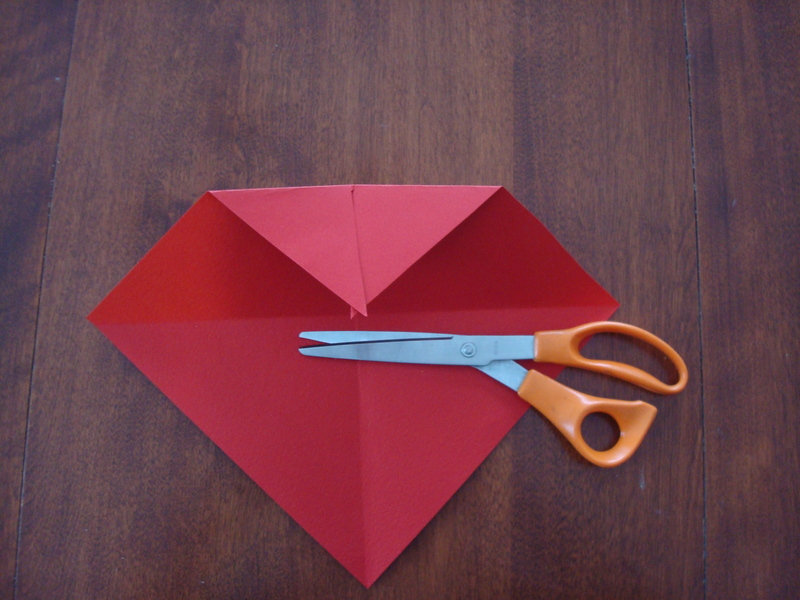 Bring a corner to the center of the paper and then fold. Repeat with the opposite corner. 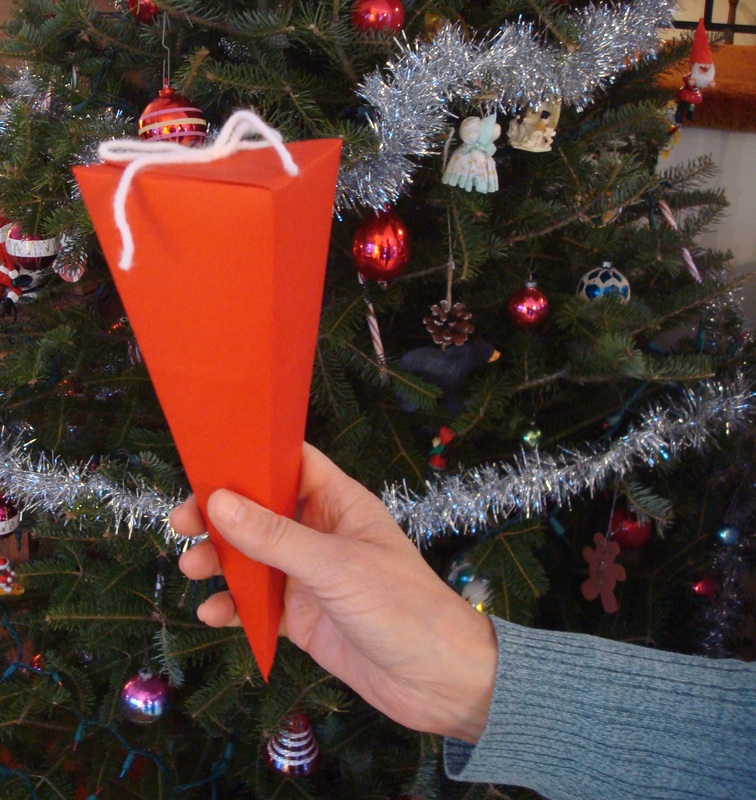 Fold the paper into the triangular shape. Thread a craft needle with yarn. Tie a knot at the end of the double strand, then pull the yarn through the two layers of paper to fasten them together. 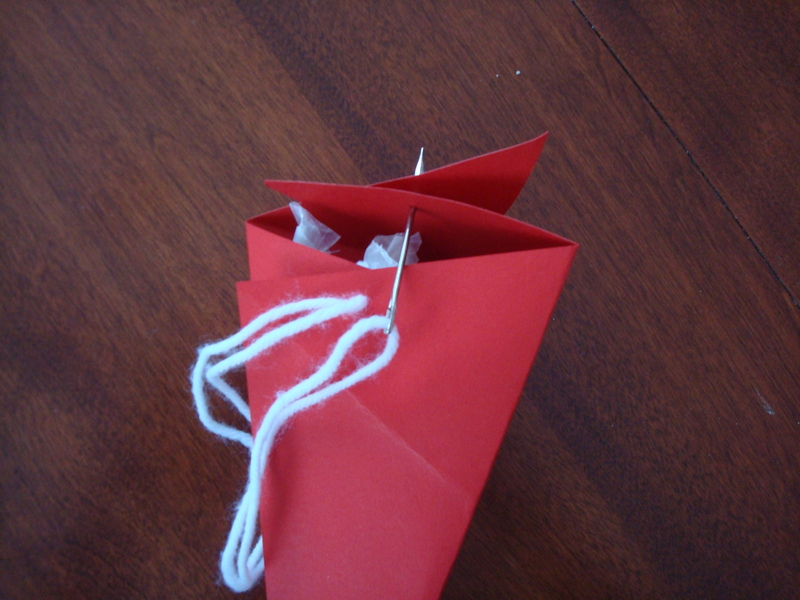 Fill with candy, then sew through the top of the box to close. Clip the yarn to remove the needle, and tie bow. These boxes are easy to make, and very attractive. I like them so much that I ended up making several, and used them for small gifts. Posted on December 23, 2013 December 22, 2013 by SherylPosted in CraftsTagged family history, genealogy. These are a great idea. Is that your tree in the background? You have some pretty decorations. Yes, it’s my tree. I decorate my tree with ornaments that I’ve accumulated over the years. Some of the ornaments originally belonged to my parents and grandparents; others are ones that I got as gifts, and my children made some of them. Oh, I’ve made that kind of box before–perfect for your candy! It is the perfect size for the candy. I can just picture kids a hundred years ago carrying these little gift boxes home from school on the last day before the Christmas break. You are so crafty!! Glad Grandma gave the taffy another try – and was successful., There’s something to be said for experience! We attempted to make rum balls yesterday. They were too soft and doughy. Melanie doesn’t like eating raw dough. So, she pressed them down with a fork and baked them like a cookie. That did the trick. We now have delicious rum cookies. We need baskets to give the neighbors. Perhaps that idea above will do the trick. It’s awesome how you improvised when the rum balls didn’t turn out right–and ended up with some delicious cookies. I don’t have much time to keep up with blogs 😦 but with a few hours spare in the run up to Christmas I’m trying to catch up – and you have certainly caught me! I love the idea of your blog and there is something particularly heartwarming in the way that you are breathing life into your grandmother’s diary – even more so at this time of year where you are bringing family together, both geographically and across time …. Thank you for taking a moment to write the kind note. It’s always wonderful to hear when someone enjoys this blog. Merry Christmas! It sure is a busy season–but it’s so much fun. Merry Christmas! Wonderful idea,! I love it. Everyone will enjoy their candy boxes filled with black walnut treats. You have me remembering black walnut ice cream now! mmm. black walnut ice is tasty! I must try this! Merry Christmas! I have enjoyed your posts all year long. I’m glad you’ve enjoyed the posts. Merry Christmas! Very neat…great idea and a great way to give that taffy!